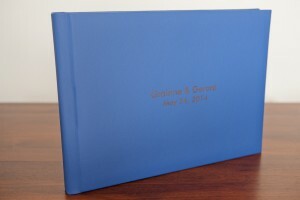 I try to have samples of the most popular wedding album choices available to show clients. Each year, these samples need to be refreshed to show new content and to be current with new presentation options. I have added some new sample wedding albums in the last few weeks. The 9″ x 6″ storybook album with USB drive is included with my standard full day coverage. There are two options available for this album. 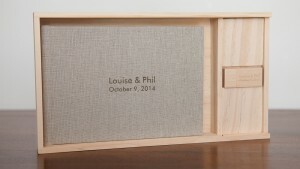 The images here show the linen covered album presented with the USB drive in a custom wooden case. The album, drive and case are laser etched with text of the client’s choice. The album is also available with a leatherette cover and USB drive together in a vinyl presentation box. The album, USB drive and presentation box can also be personalised with text that the client chooses. The 14″ x 10″ is a favourite storybook wedding album for discerning couples. It is available with a wide selection of presentation options. The photocover has been very popular in the last couple of years. The sample shown here is covered in genuine leather. There are twenty colour options available for the leather cover (Cobalt is shown here). The leather, linen and leatherette covers can be laser etched with text of the client’s choice. There is a bit more information on the Wedding albums and more page. If you would like more information on the wedding album or the choices I have available, please contact me.